Kodiak Island off the coast of Alaska is wild and untamed. Getting there requires preparation and a willingness to encounter anything the wild Alaskan summers can throw at you. The Kodiak was designed to handle the 400 mile days, sketchy mountain passes, and constant passing storms that typically accompany an epic touring adventure. The refined aesthetic and fit of the Kodiak lend comfort and confidence to your next journey. The sizing on this jacket is offered in European sizes. The sizes relate well to other European sized jackets we sell. Generally speaking, the max US chest size is roughly about 10 points smaller than the European size. (Example: A 52 Euro is about like a 42 US). If you know your European size in men’s clothing, then that will probably be the size you choose, but we suggest you measure your chest and belly and make a selection from the chart below. The first chart below is the “regular” sizes (for those with average proportions). The also offer “D” sizing, which is roughly equivalent to a “short” or “stout” size. If you look at the chart, you can see the D size gives the same max chest size, but is a bit looser in the belly and the sleeves are a bit shorter. When you look over the charts, you’ll see that the sizes offered i this jacket start at roughly a men’s Small and end at XL. That means any person larger than roughly a men’s XL or 46 suit coat size won’t be able to wear this jacket. The Kodiak jacket and pants are a product that is very similar in features to the Badlands Pro jacket. 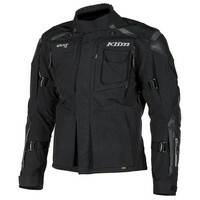 It was first designed for the European market, but then Klim released it in the US as well. The overall cut of the Kodiak is a bit more trim than the Badlands, and if you read our sizing advice, you’ll see that the entire European size range goes up to only roughly a US XL in the jacket. So if you are bigger guy than an XL US, then stop reading now and take a look at the Badlands Pro jacket. The shell of this jacket is solid textile material which is bonded to a Gore-Tex layer to make it waterproof and breathable. This jacket uses a Gore-Tex bonded perforated leather as the reinforcement material on the shoulders and elbows. That contrasts with the Superfabric material used on the Badlands. The textile leather combination in the Kodiak winds up being noticeably lighter overall than Badlands. Part of the weight loss is due to the materials, but some of it is due to the more trim cut of this jacket (less material, less weight for equivalent sizes). Personally, I really like the look of the leather on the Kodiak. I guess I’m just a bit old school and used to the day when leather was the material of choice for crash protection. The armor included with this jacket definitely all you’ll need. Its all the heavy duty D3O level 2 stuff including the back pad. The shoulder and elbow armor is a new Aero Pro version of the D3O stuff which is a bit larger and has a lot more ventilation molded into it as compared to the “standard” stuff. Additionally, there are two rectangular chest pads that cover your chest even behind the zipper (they overlap in the center with the jacket zipped). One nice new feature I see here is simple, but something I really like. I don’t have a long neck and collars can be a rub on me. But this jacket has a couple nice molded hooks on the upper chest and some corresponding loops on each collar end, so you can unzip a bit and fold down the first 5 inches or so of the collar if you like. Nice! But if you leave the collar fully up, the rubbing will be minimized because the upper edge of the collar is covered in soft material. For long hours in the saddle or for those with a tired back, there is an integrated AND removable kidney belt. It is integrated into the back of the jacket and is held in place by Velcro, Its highly adjustable for size and squeeze strength and I think you’ll like how it works. A few obscure features you’ll appreciate: on the sleeve end is the ID pocket to carry your identification and/or emergency info, and inside that pocket is a hidden pocket in the lining you can stash something in case you are waylaid, or to hide something you want to secretly carry. On the right bicep is the pocket for your GPS tracker. Take a look at our photo gallery and we’ll show you all the pockets inside and out… six in front, the big fanny pouch in back, one on the sleeve, one for the GPS and then there are a few inside. And then there is even a storage pocket for a hydration bladder.